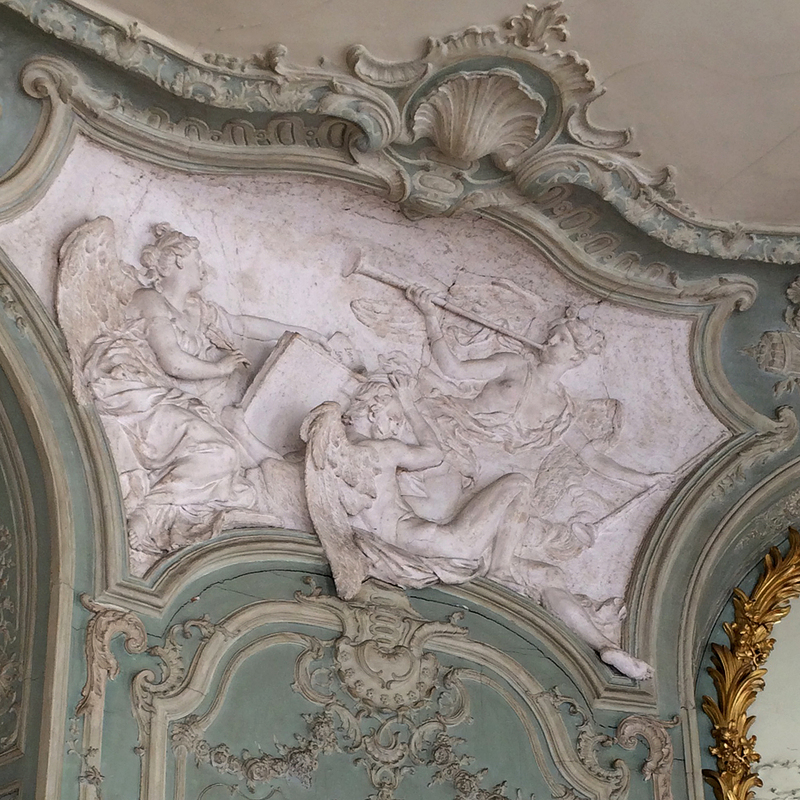 Hôtel de Soubise, ceiling detail of the Prince’s apartment on the ground floor. Ceilings of the eighteenth, nineteenth, and twentieth centuries. I’m a bit overdue with this second part. I had forgotten that I had created this as a draft way back in January when I posted the first portion of Paris ceilings. Well, the photographs had been corrected and uploaded, but the copy hadn’t been written. And all this time I was thinking I had days of work yet to do. So I procrastinated. A little chapel in the Cluny Museum, built at the height of the Gothic era, early 1500s. 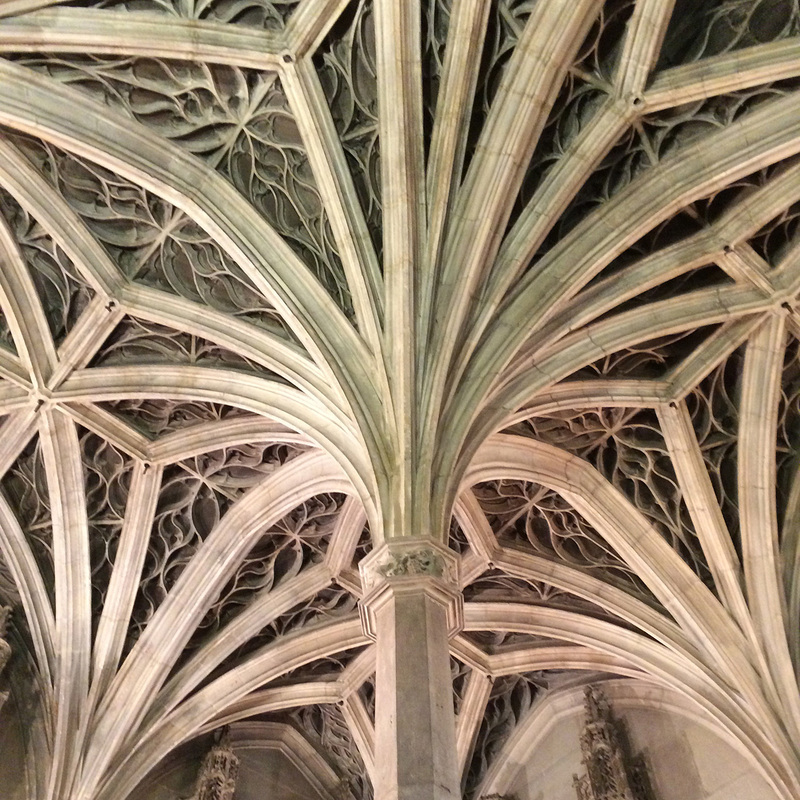 Ceilings of the Gothic, Renaissance, and Baroque styles. I spent most of my time in Paris piecing together its architectural history. Unfortunately a lot of the surviving mansions are now government institutions and are not open to the public, but if an architectural gem was open, the rooms were rarely in their original state. Historical interiors had either been stripped bare by the revolutions or heavily embellished during the Second Empire. By the way, I am no fan of that era’s design. After three weeks of effort, I did manage to find, visit, and photograph some wonderful buildings. 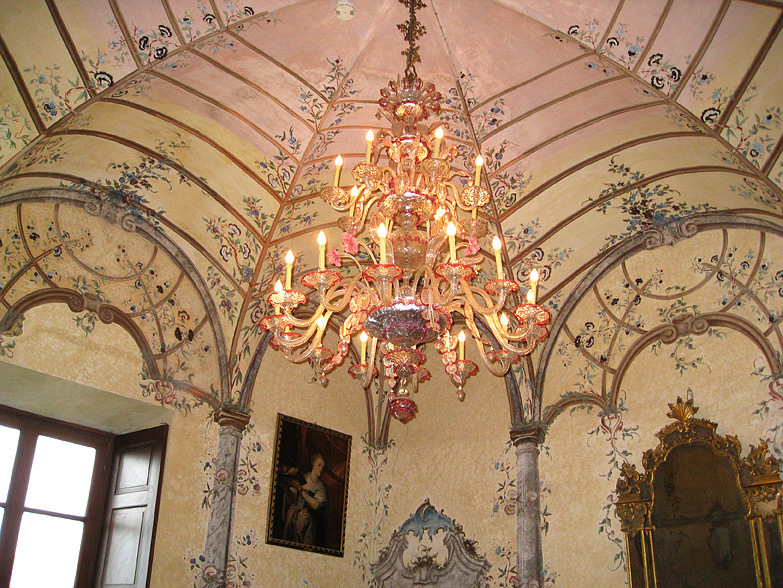 Usually if a room retained any of its original décor, it would be the ceiling. And the ceilings were amazing! All but one photo of this blog post were taken in the Louvre. I was only interested in its structural and décor history. Plus there was the newly renovated 18th-century Decorative Arts Galleries that had recently reopened. It took me a whole day to see the new galleries and another whole day to discover the building’s architectural history. 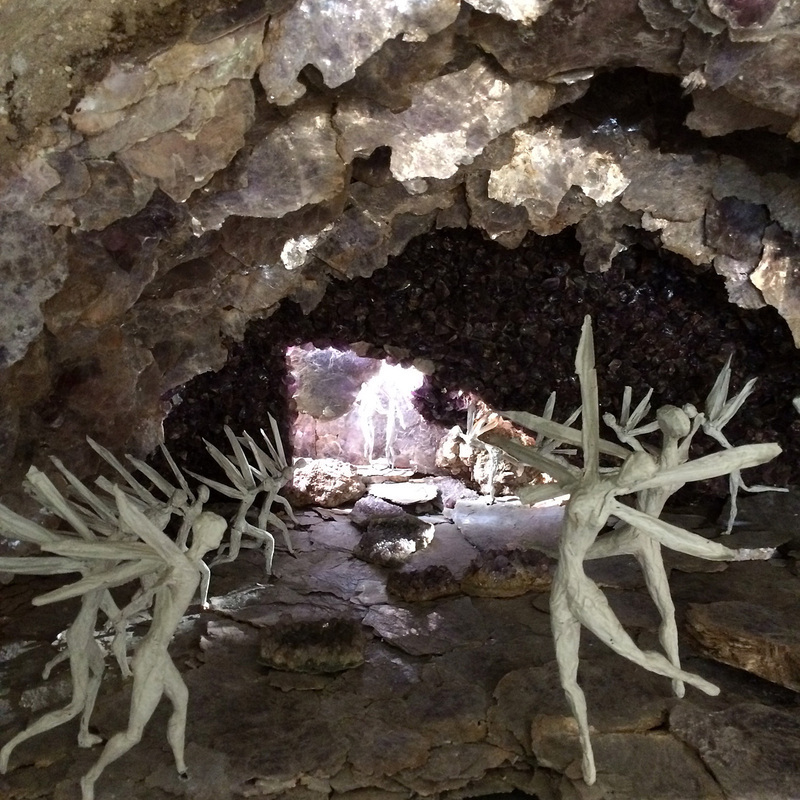 This is the first of a series of posts covering my trip to Paris, France. It’s been two months since I’ve returned, but I needed time to adjust being back. You see, after a month of wandering and living in an historical and cultural paradise, returning to my humdrum existence here in Dallas has been less than happy. I think now that enough time has passed, posting about my Parisian adventures will not trigger another case of the blues. As you’re looking at the following images, keep in mind that most of these objects were inside glass displays and were all shot with my iPhone. I did take a camera with me and alternated between the two devices, but after one week of switching back and forth, I decided enough was enough. Besides, shooting with the iPhone was the only immediate way to upload images to my Instagram account. Will It Survive the Storm? 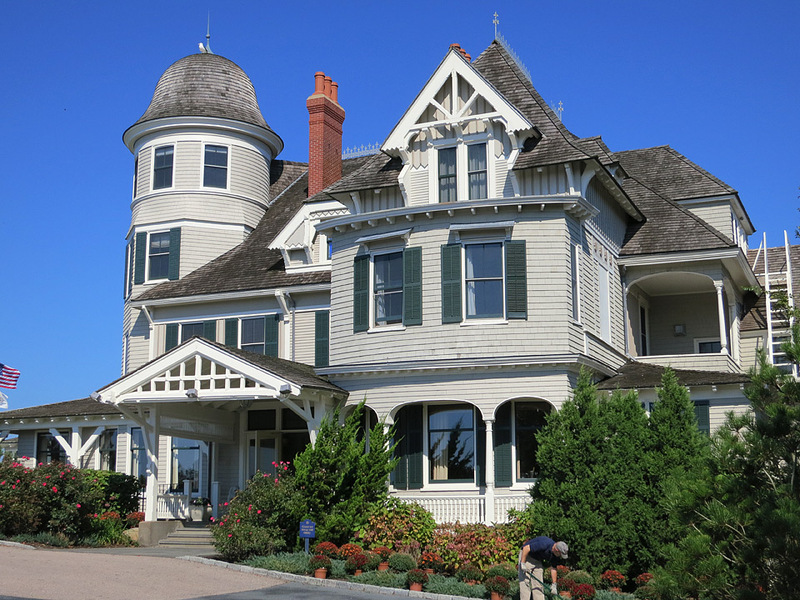 The front entrance to Castle Hill Inn in Newport, Rhode Island. I do hope Castle Hill Inn will not be disturbed by approaching Hurricane Sandy. It has weathered many severe storms in its 138 years and even lost its turret back in the early 1900s. An exact replica of the original turret has recently been built, and it would be a darn shame if Frankenstorm were to destroy it. The entrance to the cloister of San Francesco Church in Gargnano on Lake Garda. 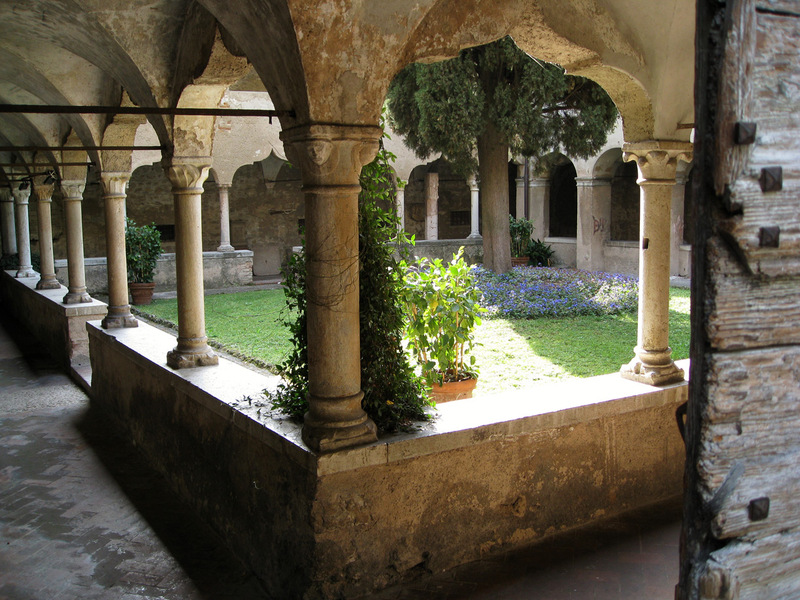 The San Francesco Church and Cloister in Gargnano on Lake Garda. Recently I wrote about the monks of the San Francesco Monastery introducing lemons to the Lake Garda area in northern Italy during the thirteenth century. But what I forgot to mention in that post was that their monastery and church, which were built in 1289, still exist today, and it was a happy accident when I stumbled upon them. For more photos of this peaceful sanctuary, click on the link below. 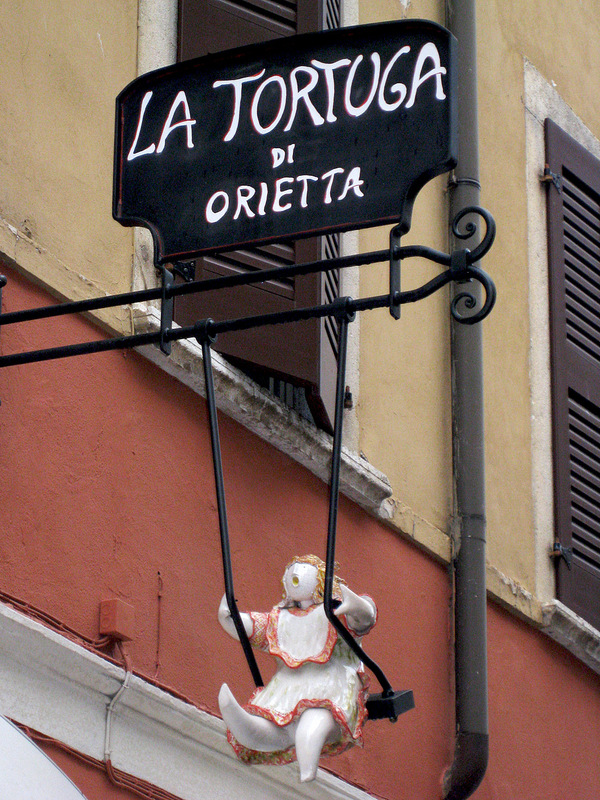 This belongs to a little restaurant in Gargnano on Lake Garda in Italy. Way back when I worked full time as an environmental graphic designer, I designed elaborate sign systems for large commercial and health care architecture projects. I worked in this field before the ADA laws went into effect and when the creative possibilities were endless. I now work on mainly print graphic jobs and web design, but my old habit of checking out signage wherever I go is a habit I have yet to break. The Venetian room inside the palazzo on the Isola Madre, Lake Maggiore. A collection of ceilings from old Italian villas. In 2007, I joined the Institute of Classical Architecture & Art for a two-week adventure exploring the historical villas and gardens of the northern Italian Lake District. Instead of grouping my collection by each individual villa, I thought it would be more interesting to present my photos taken on this trip by ceiling, wall, and floor treatments. This first post is all about fancy ceilings. 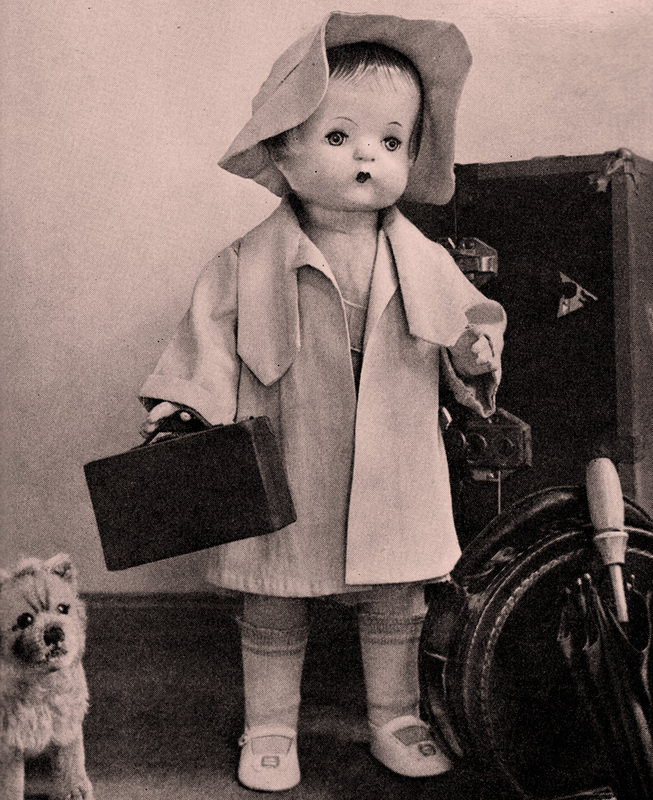 Revisiting my past travels through my digital library has been a small respite from my current daily grind which now includes cleaning, purging, organizing, packing, moving, and dispersing my mother’s effects. Four thousand square feet and eighty years of memories need to be carefully and thoughtfully dealt with. And at times it has been overwhelming. So here’s my latest jaunt down memory lane. Chiesa di San Remigio. This tiny ancient church is located next to the splendid gardens of Villa San Remigio (previously mentioned in a past post) on Lake Maggiore, one of the famous Northern Italian Lakes. This Romanesque oratory dates from the eleventh to twelfth centuries. 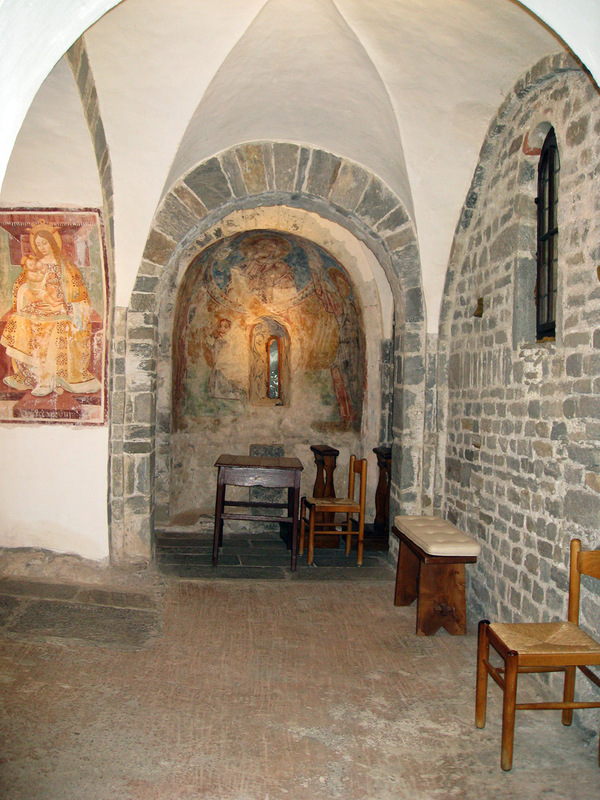 Inside, the church is divided into two asymmetric naves, an unusual feature, which is probably the result of the difficulty of building on the rock of the promontory. 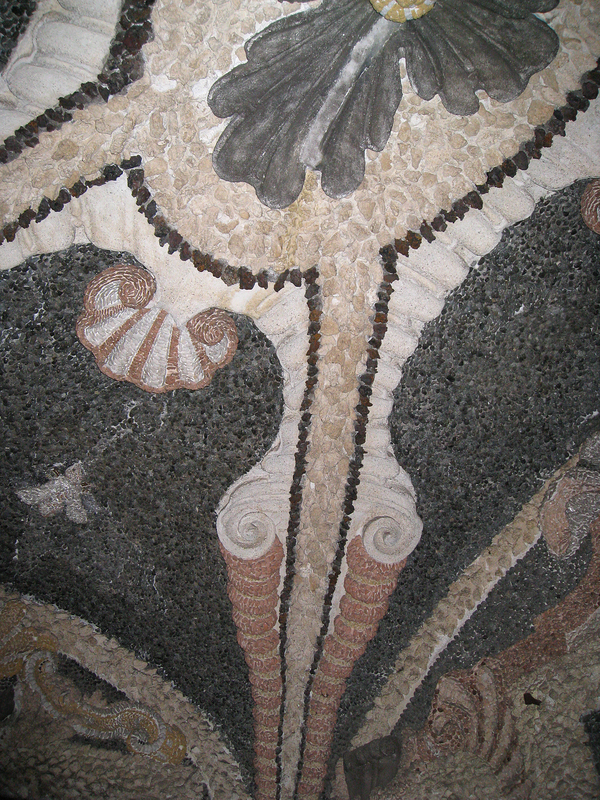 Other interior details include a groin-vaulted ceiling and semi-capitals decorated with medieval frescoes.